Jupiter Florida is located in close proximity to the Gulf Stream which allows it to have some of the best pelagic and bottom fishing on the east coast of the United States. Having amazing fishing so close to land means less time traveling to the fishing grounds and more time fishing. Our catches include, but aren't limited to snapper, grouper, kingfish, dolphin, wahoo, tuna, cobia and sailfish. Advanced reservations are recommended, however, we do accept walk ons. If you do need to cancel your reservation, please do so (at a minimum) the day before the trip. Also, PLEASE DO NOT HESITATE TO LET US KNOW IF YOU ARE NOT PLANNING ON SHOWING UP. It will allow us to make another fisherman happy by allowing him or her to take your spot. It's also common courtesy. All pricing includes your rod, reel, bait, tackle and your fishing license. We will also provide any and all instructions needed to get you and your group catching fish in no time. The information below pertains to our typical sailing day. 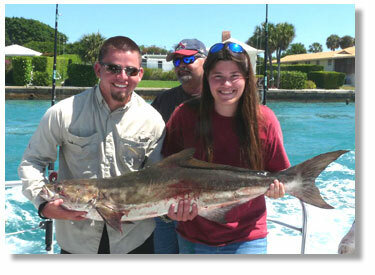 We can also customize your fishing charter if you are purchasing a private charter. Want to fish in a local tournament but don't have a fishing vessel? Charter our vessel and let our decades of local fishing knowledge give you an advantage over the competitors. We also offer non-fishing private charters. These private charters include itracoastal sightseeing cruises, sand bar excursions and burials at sea..